For other uses, see Sabotage (disambiguation). "Saboteur" redirects here. For other uses, see Saboteur (disambiguation). Any unexplained adverse condition might be sabotage. Sabotage is sometimes called tampering, meddling, tinkering, malicious pranks, malicious hacking, a practical joke, or the like to avoid needing to invoke legal and organizational requirements for addressing sabotage. A popular but false account of the origin of the term's present meaning is the story that less wealthy workers in France, who wore not leather but wooden shoes, used to throw these sabots into the machines to disrupt production. This account is not supported by the etymology. Rather, the French source word literally means to "walk noisily", as was done by sabot-wearing labourers, who interrupted production by means of labor disputes, not damage. One of its first appearances in French literature is in the Dictionnaire du Bas-Langage ou manières de parler usitées parmi le peuple of D'Hautel, edited in 1808. The verb "saboter" is also found in 1873–1874 in the Dictionnaire de la langue française of Émile Littré. But it is at the end of the 19th century that it really began to be used with the meaning of "deliberately and maliciously destroying property" or "working slower". In 1897, Émile Pouget, a famous syndicalist and anarchist wrote "action de saboter un travail" (action of sabotaging a work) in Le Père Peinard and in 1911 he also wrote a book entitled Le Sabotage. At the inception of the Industrial Revolution, skilled workers such as the Luddites (1811–1812) used sabotage as a means of negotiation in labor disputes. Labor unions such as the Industrial Workers of the World (IWW) have advocated sabotage as a means of self-defense and direct action against unfair working conditions. The experience that had the most lasting impact on Haywood was witnessing a general strike on the French railroads. Tired of waiting for parliament to act on their demands, railroad workers walked off their jobs all across the country. The French government responded by drafting the strikers into the army and then ordering them back to work. Undaunted, the workers carried their strike to the job. Suddenly, they could not seem to do anything right. Perishables sat for weeks, sidetracked and forgotten. Freight bound for Paris was misdirected to Lyon or Marseille instead. This tactic — the French called it "sabotage" — won the strikers their demands and impressed Bill Haywood. For the IWW, sabotage's meaning expanded to include the original use of the term: any withdrawal of efficiency, including the slowdown, the strike, working to rule, or creative bungling of job assignments. One of the most severe examples was at the construction site of the Robert-Bourassa Generating Station in 1974, in Québec, Canada, when workers used bulldozers to topple electric generators, damaged fuel tanks, and set buildings on fire. The project was delayed a year, and the direct cost of the damage estimated at $2 million CAD. The causes were not clear, but three possible factors have been cited: inter-union rivalry, poor working conditions, and the perceived arrogance of American executives of the contractor, Bechtel Corporation. Certain groups turn to destruction of property to stop environmental destruction or to make visible arguments against forms of modern technology they consider detrimental to the environment. The U.S. Federal Bureau of Investigation (FBI) and other law enforcement agencies use the term eco-terrorist when applied to damage of property. Proponents argue that since property cannot feel terror, damage to property is more accurately described as sabotage. Opponents, by contrast, point out that property owners and operators can indeed feel terror. The image of the monkey wrench thrown into the moving parts of a machine to stop it from working was popularized by Edward Abbey in the novel The Monkey Wrench Gang and has been adopted by eco-activists to describe destruction of earth damaging machinery. From 1992 to late 2007 a radical environmental activist movement known as ELF or Earth Liberation Front engaged in a near constant campaign of decentralized sabotage of any construction projects near wild lands and extractive industries such as logging and even the burning down of a ski resort of Vail Colorado. ELF used sabotage tactics often in loose coordination with other environmental activist movements to physically delay or destroy threats to wild lands as the political will developed to protect the targeted wild areas that ELF engaged. In war, the word is used to describe the activity of an individual or group not associated with the military of the parties at war, such as a foreign agent or an indigenous supporter, in particular when actions result in the destruction or damaging of a productive or vital facility, such as equipment, factories, dams, public services, storage plants or logistic routes. Prime examples of such sabotage are the events of Black Tom and the Kingsland Explosion. Like spies, saboteurs who conduct a military operation in civilian clothes or enemy uniforms behind enemy lines are subject to prosecution and criminal penalties instead of detention as prisoners of war. It is common for a government in power during war or supporters of the war policy to use the term loosely against opponents of the war. Similarly, German nationalists spoke of a stab in the back having cost them the loss of World War I. A modern form of sabotage is the distribution of software intended to damage specific industrial systems. For example, the U.S. Central Intelligence Agency (CIA) is alleged to have sabotaged a Siberian pipeline during the Cold War, using information from the Farewell Dossier. A more recent case may be the Stuxnet computer worm, which was designed to subtly infect and damage specific types of industrial equipment. Based on the equipment targeted and the location of infected machines, security experts believe it was an attack on the Iranian nuclear program by the United States, Israel or, according to the latest news, even Russia. Sabotage, done well, is inherently difficult to detect and difficult to trace to its origin. 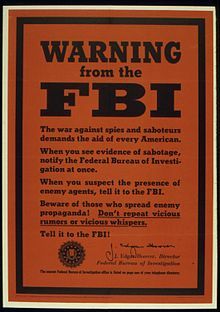 During World War II, the U.S. Federal Bureau of Investigation (FBI) investigated 19,649 cases of sabotage and concluded the enemy had not caused any of them. Sabotage in warfare, according to the Office of Strategic Services (OSS) manual, varies from highly technical coup de main acts that require detailed planning and specially trained operatives, to innumerable simple acts that ordinary citizen-saboteurs can perform. Simple sabotage is carried out in such a way as to involve a minimum danger of injury, detection, and reprisal. There are two main methods of sabotage; physical destruction and the "human element". While physical destruction as a method is self-explanatory, its targets are nuanced, reflecting objects to which the saboteur has normal and inconspicuous access in everyday life. The "human element" is based on universal opportunities to make faulty decisions, to adopt a non-cooperative attitude, and to induce others to follow suit. In making work assignments, always sign out unimportant jobs first, assign important jobs to inefficient workers with poor machines. Insist on perfect work in relatively unimportant products; send back for refinishing those with the least flaw. Approve other defective parts whose flaws are not visible to the naked eye. To lower morale, and with it, production, be pleasant to inefficient workers; give them undeserved promotions. Discriminate against efficient workers; complain unjustly about their work. Hold meetings when there is more critical work to be done. Multiply procedures and clearances involved in issuing instructions, pay checks, and so on. See that multiple people must approve everything where one would do. Spread disturbing rumors that sound like inside information. From the section entitled, "General Devices for Lowering Morale and Creating Confusion" comes the following quintessential simple sabotage advice: "Act stupid." 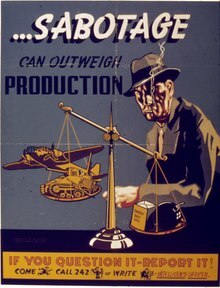 The United States Office of Strategic Services, later renamed the CIA, noted specific value in committing simple sabotage against the enemy during wartime: "... slashing tires, draining fuel tanks, starting fires, starting arguments, acting stupidly, short-circuiting electric systems, abrading machine parts will waste materials, manpower, and time." To underline the importance of simple sabotage on a widespread scale, they wrote, "Widespread practice of simple sabotage will harass and demoralize enemy administrators and police." The OSS was also focused on the battle for hearts and minds during wartime; "the very practice of simple sabotage by natives in enemy or occupied territory may make these individuals identify themselves actively with the United Nations War effort, and encourage them to assist openly in periods of Allied invasion and occupation." On 11 January 1917, Fiodore Wozniak, using a rag saturated with phosphorus or an incendiary pencil supplied by German sabotage agents, set fire to his workbench at an ammunition assembly plant near Lyndhurst, New Jersey, causing a four-hour fire that destroyed half a million 3-inch explosive shells and destroyed the plant for an estimated at $17 million in damages. Wozniak's involvement was not discovered until 1927. On 12 February 1917, Bedouins allied with the British destroyed a Turkish railroad near the port of Wajh, derailing a Turkish locomotive. The Bedouins traveled by camel and used explosives to demolish a portion of track. Japanese experts inspect the scene of the "railway sabotage" on the South Manchurian Railway in 1931. The "railroad sabotage" was one of the events that led to the Mukden Incident and the Japanese occupation of Manchuria. In Ireland, the Irish Republican Army (IRA) used sabotage against the British following the Easter 1916 uprising. The IRA compromised communication lines and lines of transportation and fuel supplies. The IRA also employed passive sabotage, refusing dock and train workers to work on ships and rail cars used by the government. In 1920, agents of the IRA committed arson against at least fifteen British warehouses in Liverpool. The following year, the IRA set fire to numerous British targets again, including the Dublin Customs House, this time sabotaging most of Liverpool's firetrucks in the firehouses before lighting the matches. Sabotage training for the Allies consisted of teaching would-be saboteurs key components of working machinery to destroy. "Saboteurs learned hundreds of small tricks to cause the Germans big trouble. The cables in a telephone junction box ... could be jumbled to make the wrong connections when numbers were dialed. A few ounces of plastique, properly placed, could bring down a bridge, cave in a mine shaft, or collapse the roof of a railroad tunnel." The Polish Home Army Armia Krajowa, who commanded the majority of resistance organizations in Poland (even the National Forces, except the Military Organization Lizard Union; The Home Army also included the Polish Socialist Party – Freedom, Equality, Independence) and coordinating and aiding the Jewish Military Union as well as more reluctantly helping the Jewish Combat Organization, was responsible for the greatest number of acts of sabotage in German—occupied Europe. The Home Army's sabotage operations Operation Garland and Operation Ribbon are just two examples. In all, the Home Army damaged 6,930 locomotives, set 443 rail transports on fire, damaged over 19,000 rail cars "wagony", and blew up 38 rail bridges, not to mention the attacks against the rail roads. The Home Army was also responsible for 4,710 built-in flaws in parts for aircraft engines and 92,000 built-in flaws in artillery projectiles, among other examples of significant sabotage. In addition, over 25,000 acts of more minor sabotage were committed. It continued to fight against both the Germans and the Soviets; however, it did aid the Western Allies by collecting constant and detailed information on the German rail, wheeled, and horse transports. As for Stalin's proxies, their actions lead to a great number of the Polish and Jewish hostages, mostly civilians, murdered in reprisal by the Germans. The Gwardia Ludowa destroyed around 200 German trains during the war, and indiscriminately threw hand grenades into places frequented by Germans. The French Resistance ran an extremely effective sabotage campaign against the Germans during World War II. Receiving their sabotage orders through messages over the BBC radio or by aircraft, the French used both passive and active forms of sabotage. Passive forms included losing German shipments and allowing poor quality material to pass factory inspections. Many active sabotage attempts were against critical rail lines of transportation. German records count 1,429 instances of sabotage from French Resistance forces between January 1942 and February 1943. From January through March 1944, sabotage accounted for three times the number of locomotives damaged by Allied air power. See also Normandy Landings for more information about sabotage on D-Day. During World War II, the Allies committed sabotage against the Peugeot truck factory. After repeated failures in Allied bombing attempts to hit the factory, a team of French Resistance fighters and Special Operations Executive (SOE) agents distracted the German guards with a game of soccer while part of their team entered the plant and destroyed machinery. Palestine Railway's K class 2-8-4T steam locomotive and freight train on the Jaffa and Jerusalem line after being sabotaged by Jewish paramilitary forces in 1946. From 1948 to 1960, the Malayan Communists committed numerous effective acts of sabotage against the Malaysian Government, first targeting railway bridges, then hitting larger targets such as military camps. Most of their efforts were centered around crippling Malaysia's economy and involved sabotage against trains, rubber trees, water pipes, and electric lines. The Communist's sabotage efforts were so successful that they caused backlash amongst the Malaysian population, who gradually withdrew support for the Communist movement as their livelihoods became threatened. In Mandatory Palestine from 1945 to 1948, Jewish groups opposed British control. Though that control was to end according to the United Nations Partition Plan for Palestine in 1948, the groups used sabotage as an opposition tactic. The Haganah focused their efforts on camps used by the British to hold refugees and radar installations that could be used to detect illegal immigrant ships. The Stern Gang and the Irgun used terrorism and sabotage against the British government and against lines of communications. In November 1946, the Irgun and Stern Gang attacked a railroad twenty-one times in a three-week period, eventually causing shell-shocked Arab railway workers to strike. The 6th Airborne Division was called in to provide security as a means of ending the strike. The Viet Cong used swimmer saboteurs often and effectively during the Vietnam War. Between 1969 and 1970, swimmer saboteurs sunk, destroyed, or damaged 77 assets of the U.S. and its allies. Viet Cong swimmers were poorly equipped but well-trained and resourceful. The swimmers provided a low-cost/low-risk option with high payoff; possible loss to the country for failure compared to the possible gains from a successful mission led to the obvious conclusion the swimmer saboteurs were a good idea. On 1 January 1984, the Cuscatlan bridge over Lempa river in El Salvador, critical to flow of commercial and military traffic, was destroyed by guerrilla forces using explosives after using mortar fire to "scatter" the bridge's guards, causing an estimated $3.7 million in required repairs, and considerably impacting on El Salvadoran business and security. In 1982 in Honduras, a group of nine Salvadorans and Nicaraguans destroyed a main electrical power station, leaving the capital city Tegucigalpa without power for three days. Some criminals have engaged in acts of sabotage for reasons of extortion. For example, Klaus-Peter Sabotta sabotaged German railway lines in the late 1990s in an attempt to extort DM10 million from the German railway operator Deutsche Bahn. He is now serving a sentence of life imprisonment. In 1989, ex-Scotland Yard detective Rodney Whitchelo was sentenced to 17 years in prison for spiking Heinz baby food products in supermarkets, in an extortion attempt on the food manufacturer. The term political sabotage is sometimes used to define the acts of one political camp to disrupt, harass or damage the reputation of a political opponent, usually during an electoral campaign, such as during Watergate. Smear campaigns are a commonly used tactic. The term could also describe the actions and expenditures of private entities, corporations and organizations against democratically approved or enacted laws, policies and programs. After the Cold War ended, the Mitrokhin Archives were declassified, which included detailed KGB plans of active measures to subvert politics in opposing nations. Sabotage is a crucial tool of the successful coup d'etat, which requires control of communications before, during, and after the coup is staged. Simple sabotage against physical communications platforms using semi-skilled technicians, or even those trained only for this task, could effectively silence the target government of the coup, leaving the information battle space open to the dominance of the coup's leaders. To underscore the effectiveness of sabotage, "A single cooperative technician will be able temporarily to put out of action a radio station which would otherwise require a full-scale assault." Railroads, where strategically important to the regime the coup is against, are prime targets for sabotage—if a section of the track is damaged entire portions of the transportation network can be stopped until it is fixed. A sabotage radio was a small two-way radio designed for use by resistance movements in World War II, and after the war often used by expeditions and similar parties. Arquilla and Rondfeldt, in their work entitled Networks and Netwars, differentiate their definition of "netwar" from a list of "trendy synonyms", including "cybotage", a portmanteau from the words "sabotage" and "cyber". They dub the practitioners of cybotage "cyboteurs" and note while all cybotage is not netwar, some netwar is cybotage. Counter-sabotage, defined by Webster's Dictionary, is "counterintelligence designed to detect and counteract sabotage". The United States Department of Defense definition, found in the Dictionary of Military and Associated Terms, is "action designed to detect and counteract sabotage. See also counterintelligence". During World War II, British subject Eddie Chapman, trained by the Germans in sabotage, became a double agent for the British. The German Abwehr entrusted Chapman to destroy the British de Havilland Company's main plant which manufactured the outstanding Mosquito light bomber, but required photographic proof from their agent to verify the mission's completion. A special unit of the Royal Engineers known as the Magic Gang covered the de Havilland plant with canvas panels and scattered papier-mâché furniture and chunks of masonry around three broken and burnt giant generators. Photos of the plant taken from the air reflected devastation for the factory and a successful sabotage mission, and Chapman, as a British sabotage double-agent, fooled the Germans for the duration of the war. In Japanese, the verb saboru (サボる) means to skip school or loaf on the job. ^ a b c "Sabotage". Online Etymology Dictionary. ^ D'Hautel, Charles-Louis (1808). Dictionnaire du Bas-Langage ou manières de parler usitées parmi le peuple [Dictionary of slang or ways to speak used by the people] (in French). D'Hautel et Schoell. p. 325. Saboteur : Sobriquet injurieux qu'on donne à un mauvais ouvrier, qui fait tout à la hâte, et malproprement. ^ Littré, Émile (1873–1874). Dictionnaire de la langue française [Dictionary of the French language]. Hachette. p. 1790. ^ Pouget, Émile (1976). Le Père Peinard. Éditions Galilée. p. 53. ISBN 2718600306. ^ Pouget, Émile (1911). Le Sabotage. Marcel Rivière. ^ Roughneck, The Life and Times of Big Bill Haywood, Peter Carlson, 1983, page 152. ^ Roughneck, The Life and Times of Big Bill Haywood, Peter Carlson, 1983, pages 196–197. ^ Rinehart, J.W. The Tyranny of Work, Canadian Social Problems Series. Academic Press Canada (1975), pp. 78–79. ISBN 0-7747-3029-3. ^ "The Secret History of Tree Spiking – Part 1". iww.org. ^ Wilbur Redington Miller (29 June 2012). The Social History of Crime and Punishment in America: An Encyclopedia. SAGE Publications. p. 186. ISBN 0-7618-6137-8. ^ David Churchman (9 May 2013). Why We Fight: The Origins, Nature, and Management of Human Conflict. University Press of America. p. 186. ISBN 0-7618-6137-8. ^ Markoff, John, "Malware Aimed at Iran Hit Five Sites, Report Says", New York Times, 13 February 2011, p. 15. ^ Marrin, Albert (1985). The Secret Armies : Spies, Counterspies, and Saboteurs in World War II. New York: Atheneum. p. 37. ISBN 0-689-31165-6. ^ "Office of Strategic Services Simple Sabotage Manuel" (PDF). 17 January 1944. pp. 1–2. Retrieved 24 March 2012. ^ "Office of Strategic Services Simple Sabotage Manuel" (PDF). 17 January 1944. pp. 28–31. Retrieved 24 March 2012. ^ "Office of Strategic Services" (PDF). 17 January 1944. p. 2. Retrieved 24 March 2012. ^ McGeorge II, Harvey J.; Christine C. Ketchem (1983–1984). "Sabotage: A Strategic Tool for Guerilla Forces". World Affairs. World Affairs Institute. 146 (3): 249–256 . JSTOR 20671989. ^ Conduit, D.M. ; et al. (1968). Challenge and Response in Internal Conflict, Volume II: The Experience in Europe and the Middle East. Washington: The American University. ^ Marrin, Albert (1985). The Secret Armies : Spies, Counterspies, and Saboteurs in World War II. New York: Atheneum. p. 77. ISBN 0-689-31165-6. ^ Marrin, Albert (1985). The Secret Armies : Spies, Counterspies, and Saboteurs in World War II. New York: Atheneum. p. 83. ISBN 0-689-31165-6. ^ Jean-Paul Pallud (28 May 1987). Ardennes, 1944: Peiper and Skorzeny. Osprey Publishing. p. 15. ISBN 0-85045-740-8. ^ Report prepared by the Historical Evaluation and Research Organization under contract for the Army Research Office (1966). Isolating the Guerrilla: Classic and Basic Case Studies (Volume II). Washington: Historical Evaluation and Research Organization. ^ Conduit, D.M. ; et al. (1967). Challenge and Response In Internal Conflict, Volume II: The Experience in Europe and the Middle East. Washington: The American University. ^ McGeorge II, Harvey J.; Christine C. Ketchem (1983–1984). "Sabotage: A Strategic Tool for Guerilla Forces". World Affairs. World Affairs Institute. 146 (3): 249–256. JSTOR 20671989. ^ "Food Scare Scandals". The Independent. 16 June 1999. ^ Luttwak, Edward (1968). Coup d'Etat, a Practical Handbook. London: The Penguin Press. p. 119. ISBN 0-674-17547-6. ^ Luttwak, Edward (1968). Coup d'Etat, a Practical Handbook. London: The Penguin Press. p. 128. ISBN 0-674-17547-6. ^ John Arquilla; David Ronfeldt, eds. (2001). Networks and Netwars. RAND. pp. 5–7. ISBN 0-8330-3030-2. ^ Marrin, Albert (1985). The Secret Armies. New York: Atheneum. p. 24. ISBN 0-689-31165-6. Émile Pouget, Le sabotage; notes et postface de Grégoire Chamayou et Mathieu Triclot, 1913; Mille et une nuit, 2004; English translation, Sabotage, paperback, 112 pp., University Press of the Pacific, 2001, ISBN 0-89875-459-3. Pasquinelli, Matteo. "The Ideology of Free Culture and the Grammar of Sabotage"[permanent dead link]; now in Animal Spirits: A Bestiary of the Commons, Rotterdam: NAi Publishers, 2008. Wikimedia Commons has media related to Sabotage. News, accounts and articles on workplace sabotage and organising – Sabotage, employee theft, strikes, etc. "The Tallinn Cables, A GLIMPSE INTO TALLINN'S SECRET HISTORY OF ESPIONAGE, Lonely Planet Magazine, December 2011" (PDF). Archived from the original (PDF) on 13 November 2013.